Are you active in the e-commerce sector? Are you involved in cross-border trade? If so, you are well aware that international trade and customs rules play a key role in your business. Staying up-to-date with trade regulations and the practices of customs administrations is key for ensuring predictability of shipments and managing risks and costs related to cross border e-commerce operations. 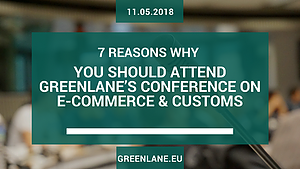 For insights and information about the latest trends, Greenlane – a unique alliance of independent European law firms specialized in customs and international trade law – invites you to a conference on e-commerce & customs held on Friday, May 11, 2018 at the Acropolis Museum in Athens (Greece). This unique event will gather lawyers as well as public officials and experts from Greece and other European jurisdictions. For those of you concerned about compliance and e-commerce, here are 7 reasons to attend this conference. International trade laws and customs practices keep evolving. Companies active in E-commerce and trade imported goods should be mindful of potentially costly compliance issues. Minimize risks and ensure to make use of potential upsides by learning key trends from Greenlane’s extended network of international trade firms. Greenlane is a unique European alliance of over 50 expert trade lawyers that focus on customs and international trade law. Practice areas include customs, trade defense, export controls and sanctions, and excise duties and regulations. This half-day conference allows you to connect with trade law experts from several European Members States and beyond. Join us to learn about IP border enforcement, controls on suspected counterfeit products (either imported or in transit), as well as the challenges that customs authorities are experiencing. Panel discussions will focus on the latest issues involving e-commerce platforms, sales and customs controls on postal parcels. Importers of goods into the EU are responsible for ensuring they comply with all applicable rules and laws. Greenlane has put together a panel of customs officials, operators, and lawyers who are experts in issues such as the registration of chemicals (REACH), marking and labelling, toy safety, etc. If your goods are manufactured in countries with cheap labour, they may be imported at low prices compared to similar goods imported intot he EU. Customs authorities are increasingly rejecting the declared value for these goods and use instead a higher value for these goods, based on the average value for goods classified under the same tariff position. Learn from our experts about this issue, before behind confronted with unexpected costs. Often called “the historic capital of Europe,” Athens has everything to offer from the best in history in the ancient ruins to the most amazing modern structures, such as the Acropolis Museum where the conference will be held. May is one of the best times of the year to visit Athens. Expect perfect mild weather and less tourist crowds. To learn more about how you can attend Greenlane’s Conference on E-Commerce & Customs, click here.